For those not in the know, PMP (Project Management Professional) certification is the best way for managers and other professionals to show that they have the ability to manage, lead, and direct both projects and teams. Project management can be difficult and many people who find themselves managing projects may not always have the education they need to be as successful as possible. Are you someone who has been managing projects for years but just can’t seem to move as high up the professional ladder as you would like? What may be holding you back is a lack of certification. PMP certification may be just the thing you need to advance your career and move on up in the world. Therefore, it makes sense to look for the best PMP certification training online. The PMP exam is not only recognized by many businesses and organizations all over the world, but is a requirement before many will hire you or promote you to a high-level Project Management position. Taking (and passing) the PMP Certification Exam shows that you are serious about managing projects and teams and that you have all the skills necessary to do so. For many people, this is an essential step in achieving their career goals and advancing to the next level. Professionals with PMP certification under their belt are more likely to be the ones handling the highest performing projects for their company. Of all the certifications out there, the PMP also comes with some of the highest wages. Companies benefit from hiring PMP certified professionals as well, as those with more PMP certified employees have more success in their projects. All around, having a PMP certificate is good for you and good for the company you work for. PMP certification isn’t just about taking a test either – you have to meet certain requirements before you can even sit down to take it. Potential PMP candidates need either a form of secondary degree (like a high school diploma or an associates degree) or a four-year degree. Those with secondary degrees then need at least 7,500 hours leading and directing projects, while those with four-year degrees only need 4,500 hours. Both types of candidates then need 35 hours of education and training in project management. But where do you find the time to get that training and study for an exam if you’re already working full time in a project management role? The best way to make time in your already busy schedule is to take those 35 hours of project management education online. There are no doubt many places you can do so, but one of the best online PMP certification programs can be found at Master of Project Academy. To date, Master of Project Academy has had over 50,000 students complete their courses, from over 180 countries. What began as a series of university project management courses has blossomed into a site with many classes to choose from. The team of instructors, developers, authors, editors, and designers have worked with the founder on providing quality education for professionals all around the world, on not just the PMP exam but other professional certifications as well. Master of Project Academy aspires to be the best place for professionals to learn the skills they need in order to advance their careers. They provide affordable, high-quality classes that are designed to allow professionals to go at their own pace and complete their education while still working full-time. There are no scheduled classes and no fixed study times. Each person taking the class can work on their own schedule, at their own pace and still be able to find time for everything else in their life. The best thing about Master of Project Academy is that they are not stagnating in the education they offer. Each member of the team realizes that they are all still learning and can, in fact, gain knowledge from the professionals taking their courses. They highly value the feedback that everyone has to offer and use that feedback in order to improve their courses. This means that you can trust you’re getting the most up-to-date information and that your instructors are making sure they are providing you with the best possible knowledge they can. Master of Project Academy currently offers three PMP courses, as well as additional practice PMP exams, study materials, and lectures. The first course is the 35 Contact Hours Online PMP Training. As you can see, this course can fulfill the 35-hour project management education requirement for becoming PMP certified. This course is 100% self-paced; there are no deadlines to meet and no set due dates for completing any of the lectures or coursework. You’ll learn what exactly the PMP is and why it’s so important, as well as how to apply for the PMP Certification Exam. Once that’s out of the way, you’ll get into learning more about project management. In the introductory section, you’ll learn about the different environments that may need project management, different organization structures, constraints on projects, the life cycle and phases of projects, and the relationship between projects, programs, and portfolios. Following the introductory lectures, you’ll move on to learning about different project management processes, such as initiating, planning, executing, monitoring and controlling, and closing process groups. From there you’ll continue learning everything there is to know about project management: the role of a project manager, scope management, schedule management, cost management, quality management, resource management, communications management, risk management, and more. At the end of the course, you’ll go over the Code of Ethics and Professional Conduct and then continue on to answering some practice exam questions. It sounds like a lot but there’s no need to worry! If you’re already a professional in the project management field, some of this is knowledge you may already have. Even if it isn’t, you have as much time as you need to go through the lectures and answer practice questions to really make sure you are comfortable enough to take the PMP Certification Exam. The next course that is available is the PMP Exams & Math Lectures course. This includes seven different practice PMP exams that are designed to be as realistic and close to the real thing as possible. As there is a math section in the PMP exam, this course also has lectures available to review and refresh your math skills. You’ll go over estimating, earned value management, the critical path method, and expected monetary value. Once you’ve got all the exams and lectures completed, there is a module on how to submit a PDU claim in order to get credit for the training you’ve completed. 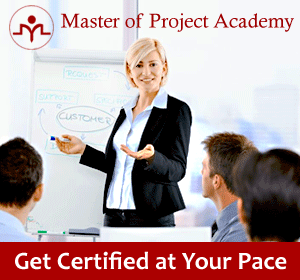 Finally, Master of Project Academy offers a Free PMP Training course. This includes some sample lectures and handouts from the above two training courses, as well as free study materials, tips and tricks from recent exam takers on how to best study for the exam and maximize your efforts, frequently asked questions about the PMP, and instructions on how to apply to take the PMP Certification Exam. This is a great place to start if you’re unsure about paying for a course, as it has examples of material that is available in the paid courses. It’s also a good way to brush up on your knowledge before an exam if you’ve already completed your 35 hours of training. PMP certification is absolutely necessary if you want to advance your career as much as possible. No matter how good of a project manager you are, sometimes companies just aren’t going to see that without a PMP certificate. Completing the training is also a good way to go from an average project manager to a great one. Anyone, at any point in their project management career, can benefit from taking some form of PMP training course. Those with PMP certification also earn an average of 20% more than those without the certification so that is certainly an incentive to take the exam! Master of Project Academy truly is one of the best ways to study for the PMP exam. Past students find their courses easy to understand and say that the practice tests are very close to what you’ll actually see when you take the exam. After successfully completing these courses, the students felt more confident taking their exams and many even scored “above target” on each section of the test. Taking these online courses is one of the best ways to set yourself up for success. Even if you just browse through some of the free lectures, you can be sure that this is some of the best online PMP certification training out there and that completing it will help you on your way to becoming a PMP certified professional.